Gernet, Jacques (1990). Le monde chinois. Paris: Armand Colin. de Crespigny، Rafe. 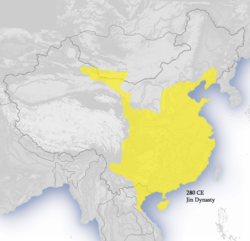 HE THREE KINGDOMS AND WESTERN JIN A HISTORY OF CHINA IN THE THIRD CENTURY AD. https://digitalcollections.anu.edu.au/html/1885/42048/3KWJin_sources.pdf۔ اخذ کردہ بتاریخ 11 July 2016.